The greatest thing that can happen to a teacher is the aha! moment when suddenly the students get it. And this happened to me on Thursday. I was teaching the modal verbs of deduction for a hundredth time and suddenly the students could understand it and use it correctly. Wonderful feeling!!! In this post I would like to share all the materials I used in the lesson. There is a mind map and two games. Moreover, for the teachers of English there is a hand out for an activity called pair cards. Look at the ways how you can express different degrees of certainty using various modal verbs. The meaning of the modals is often influenced by the context. These mathematical expressions of the meaning should be understood in context. By these modal verbs the speaker expresses how certain he is about the given thing . 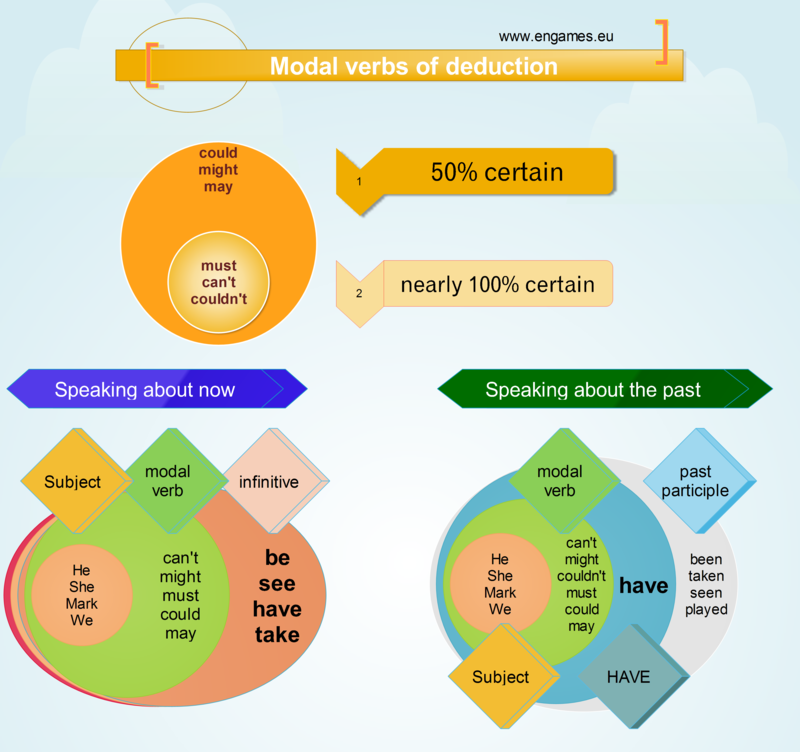 In the following quizzes you can find about 30 different sentences to practise the usage of Modal verbs for deductions. Both of the quizzes are in HTML5 and thus they should work on your mobile devices supposing they support this technology. In the first quiz you should complete the second sentence is such a way that its meaning will be the same as the first sentence. Sometimes more than one answer is correct however you have to use the modal verbs of deduction all the time. If you pass the test you can try our new game called Tower defence. One of my favourite grammar activities is called Pair cards. Cut the worksheet into four different cards. Ask the students to work in pairs and give each student one of the cards. Make sure that each student in the pair has a different card. On each card some sentences are blue and some are white. The blue ones are the correct answers and the white ones are the students’ task. Students work in pairs and they read their white sentences and complete the one with the gap in such a way that it has the same meaning as the first one. Their partner listens to them and checks their answer in the blue sentences. Students take turns and go through the whole cards. Students do not write anything! They just read their answers so they can swap the cards and do the same if they get to the end. Love the site.I am interested in and important for me as well. There a few mistakes in the pairwork activity. Some of the sentences are a bit mangled. Other than that, great job. Sorry about the mistakes. I will try to work on them.